For the last couple of years I have enjoyed writing for you—digging through old magazines and crumbling books, touring the various highways and byways of interior design. Few experiences in my writing life have been more delightful or more fulfilling. But blogging takes a toll. I'm exhausted, frankly, and have decided to bring An Aesthete's Lament to a close. But I wish to thank you for your encouragement, your words of praise, your occasional brickbats of criticism, and most of all, your desire to make your personal world more beautiful and more delightful. I'm heartbroken! Will you continue The Aesthete Cooks? So that's why my china comment didn't go through---I was raving on about a japonesque creamware dinner service I once owned, and you were shutting down. And, sadly, took your posts with you, I see---I hope this can only mean that you complile the best as a book. There was some awfully good design and social history in there. Thanks for all that you shared. Another contribution to the death of beauty. All I can do is thank you for your amazing posts, the quality and breadth of which explain why you might need a well-deserved rest. You have brought me so much pleasure. Thank you. You have done a real service to bloggers everywhere by raising the bar of what a wonderful experience posting can be for the reader and the writer. I hope you find another successful endeavor. I will begin to file away some of the best from your history and be grateful for your diligence. F*CK!!! Sad to hear it. You'll be truly missed! Sir, I am going to miss your writing and your insights and I want to thank you for helping making my days be more interesting. Thank you. I wish you well. Thank you for making my days all the more interesting for having read your blog. Good luck and goodbyr for now. Thanks you for daily inspiration as well as visual treat! Thank you for your wonderful insights and, of course, your wonderful prose. I hope new book projects are underway. To you and yours, all the best. Sorry to hear. All best wishes. Yours was the place where I could take my self to revel and wonder over all those topics so precious to me and forgotten, if ever known of, by most of the world. Your content,knowledge and coverage were masterful. I'll miss my daily browse. As for the china, I'd trade every set I own for a complete one of Royal Crown Derby, "Traditional Imari".... joined with a heaping helping of Tiffany "English King" and topped off with a little Baccarat, "Geneva". Yup, That would do it for me. Oh. wait, what about the Wedgwood, "W1959 Swallow"....??? I'll leave you with a smile on my face and thanking you for all of your delightful efforts. So, we have to revise and to revisite what we see with you. Why not take a nice long sabbatical, then reconsider? shine, and naturally that sort of writing is time consuming. Still~admit it, Aesthete, this blog gave you scope and range, it was expressive of a refined, constantly evolving sensibility. We readers benefited of course~but who else is going to offer us what you've provided here? You've spoiled us, is what I'm trying to say. You have been a real source of inspiration for many, but for me...a touchstone to the Gloried Past. I friend who knew the path. I am at a loss. You should reconsider after a little holiday to the worst part of the World, for there, Beauty will be, but in hidden anguish over her acolytes' not lighting the candles of Truth. Love of what one does is so fragile, sometimes too much for our little shoulders too bear. Be well, stay in touch, think of all the Souls who have long gone...should you ever wish to speak, I am here. Horrible awful news & all our days will be much duller & grayer without your witty & inspiring blog. You will be missed - wonderful job! Please let us know when your next project comes out. AAL- I have taken a scientific poll of your followers and it has been unanimously decided that YOU MAY NOT QUIT. We haven't quite decided what the punishment will be if you persist in this foolish idea of yours, but we're working on it. I feel like a dear friend has moved to the West Coast. Oh no!!! Can you at least go on a goodbye tour so I can get used to the idea?! An irreplaceable loss. Enjoy your well-deserved rest; and know that you will be missed. Oh dear, what a loss. I don't have that many favorites. Best wishes to you, and thank you for what you brought. It was special. because of you (and your brilliance) i feel more dapper and smarter and happier and more discerning and more optimistic and more venturesome and... more influenced. What?! Seriously? You are my daily must-read and favorite blog that I so look forward to. Please don't stop! I now understand how Mona Bismarck felt when Balenciaga closed its doors. I am speechless and adrift. I can not possibly overstate how much your blog has meant to me. I have learned so much from it and am so grateful for the time and energy you've devoted to it. Thank you for sharing your encyclopedic knowlege with all of us. You've enriched my life immeasurably. Thank you. You will be sorely missed. You're daily email postings were a wonderful little break in the day. You introduced me to a lot of influential people I did not know. I can only imagine the time required to produce and maintain the quality of product you were putting out there for us to enjoy. Thank you for all your efforts. Thank you for what you have generously given. I can understand how a blog as consistently interesting as yours has been could be quite time consuming to produce. I've certainly enjoyed and appreciated your posts, and will miss your unique voice. Lately, even though I'm just a reader of design blogs, I too have been questioning the time commitment and wondering if I haven't been allowing myself to get sucked ever deeper into a virtual world of beauty, rather than going out and seeking my aesthetic fix in the real world. Anyway, many thanks for months of enjoyment! This is really awful. I am so sad to see you go. Firstly, many thanks for enriching our days with intelligent prose and gorgeous imagery. A book, surely. Or an e-book? 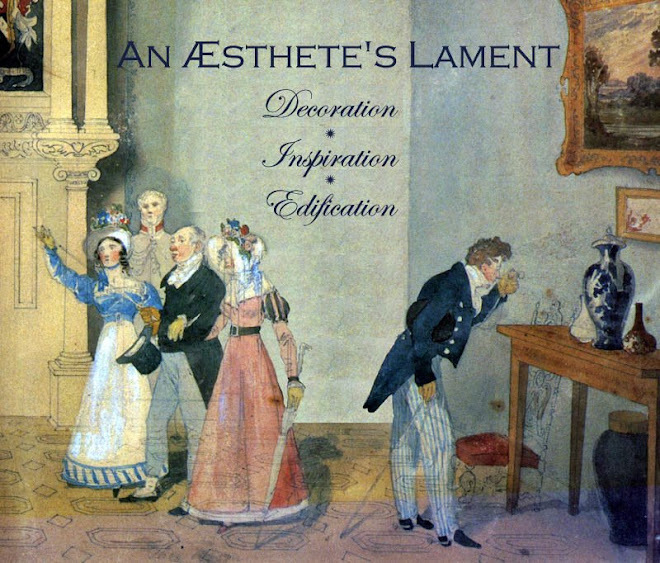 What the world will loose without a full compilation of The Aesthete's Lament! Oh I have enjoyed hearing you speak and reading your blog and I will miss dropping by. I am sure the avenues of your writing will now only expand, so I am sure I will see you and read you in the future. Thanks for all of your posts. Ach~ Bring the smelling salts I feel faint, the room is spinning! The great critique of modern ugliness and tireless defender traditional goût has fallen in battle. Who shall take up the banner and continue the charge? We will remember your bravery and courage in the face of kunstentarte and thank you for gracing us with fine images and unpolished opinion. There's "real" life & then there's this one, and in my online life, this is the worst news I ever heard. E v e r. You were the absolute best of the best. very sad. good luck with your next endeavor - i'm sure it will be just as great! You shall be missed - yours was the only blog I checked daily to see what new delight was in store, and how disappointing that all your previous posts vanished - any chance of getting them back? Fine praise here. And I am in full agreement with both Toby and Magnaverde. I'm so sorry to read this - I have read you religiously for the past year and a half. I'm sure it has been an intense project, given the wonderful quality and frequency of your posts. Nothing ever, ever disappointed. Thank you for it all. I can't believe I will no longer be able to visit your lovely gentle world! Visiting it has been such a pleasant distraction through my (successful) battle with cancer these past two years, and I've learned so much - thank you, thank you, thank you! I wish you and your family peace and happiness in the coming days and years. You will be truly missed. I can completely understand. I wish it were not so, I do enjoy your wisdom. Sad to see you cross the finish line of blogging. I'm so sorry to hear that! Thank you for the intelligent and entertaining posts you given us in the past, and best of luck in the future. I will so miss your intelligence, wit, and of course aesthetics...which I've come to look forward each morning with my coffee. Wishing you all the best. Thank you so much for your beautiful blog and all the quality and passion that you poured into your posts. We will all miss you! Wishing you all the best and success in future endeavors. As my eyes fill with tears, I've the presence of mind to beg your expert advice: Which handkerchief would be best suited to this grievous occasion? I too am heartbroken, but thank you for the many great ideas and things to think about over the past few years. Enjoy your summer and your family. We'll miss you. NO! truthfully, I've always wondered where you found the time. please, please don't erase your blog - it's such a great source for research. we'll all miss you tremendously. You have benn my go-to, first read EVERY morning for over a year. I have so very often felt you were the only one who knew of, and loved the same odd, esoteric things as I. Yet, you have the gift to be able to so eloquently share them. I bow, offer grave and very great THANKS, wish you all the best in your next endevores, and shall remian in awe of your ability to share and educate so wonderfully, create worlds out of words, and inspire. So sad to loose you and your super posts. I learned so much over the past two years; but I do know that "for everything there is a season"--thank you and be well. But I've just found you!! So sad!!! This is the worst news! Just terrible. I have learned so much from you and you've opened my eyes to so many new people, new ideas and fascinating rooms and houses. Thank you so much for all of the time and effort you've expended bringing AL to all of your fans. We all appreciate the effort. I am very sad, I have learned so much from your posts. The Aesthete will be profoundly missed. Thank you for all you have given us. Please, please, do not stop blogging. I look forward so much to your posts, they really brighten my day. This is a tragedy. Your rarefied eye, your dazzling intelligence and your incisive wit were a shining beacon in my day. I completely understand your remark about the toll blogging takes, but legions and legions of fans will miss you. Where will we turn now for a "Well Said" quip? Or a reflection on why a classic piece of furniture isn't made anymore? Or just a lovely childlike diagram of the seating at one of your dinner parties? You are the best fashion blogger in the world, don't do this please!! Oh-! This can't be True-! Your literary standard so high - how will you ever be replaced-! Thank You for All of your delightful Posts and the Effort you put into them-! I love this blog too, but the problem is, it's a rare blog that makes any money at all for the writer. Free is great for readers, but for writers? There are grants, yes, a few; a meager number of ads for those who seek them (not enough to sustain anyone). Blogs die not because the blogger is exhausted but because the blogger has to make some money. Quel dommage - a little light goes out of my life! I am sad too. You have been a wonderful inspiration, and as you know "one of my favourite blog reads" too. I quite understand why you have come to this decision. I sometimes feel the same way too, when the joys of blogging elude me. And indeed, I'm going through that right now. I think I will just take a rest. I beg you to do the same, so that you come back refreshed. Next time you can pace yourself too. This daily posting malarkey can sometimes be a bit too ambitious, especially with all the work you put into such endeavours. Such bad news. Could you please leave up your archived posts?? I have been following your blog for the last year and a half and have thoroughly enjoyed it. In fact it is the first port of call when I turn my computer on in the evening! I will miss your writing. Thank You. Oh, I'm so sorry to see you go! Good luck in your next endeavors --- might a book by you be coming? Your writing has been a privilege to read. I have considered each of your postings as a little jewel intended for my pleasure and edification. I will miss the sparkle and the inspiration. Thank you for sharing your thoughts and your insights. You will be missed. You are the best!! It seems impossible that we will not hear from you, but I hope we will again in future, in a new way. Thank you, we'll be thinking of you! I am always saddened when the leaves begin to turn or the air begins to have the bite of winter, however everything that dies is reborn again in another season. It's been a pleasure reading. Best of luck! Perhaps you shall second guess your desire to leave the party so soon, stay, let's have one more drink and a few more posts. Exhaustion understandable. Closure definitely not. Selfish me. I know what it is to raise a family AND try to live a life of beauty and taste. Thank you for everything you have given us; my life (and, unwittingly, that of my own family) has been enriched by your love for this work and your generosity in sharing it. Please tell me we can still access your archives for a little while? A shock to hear. But perhaps not a surprise given the amount of effort and quality you put into it. A true labor of love. Perhaps a little break is in order, which could help recharge. Or a change in direction. Clearly your blog has become an inspiration and sounding board for many. It would be a shame to see it end. If this is to be, thank you for your efforts. It has been an inspiration to me as well as countless others. You inspired a post in me! No! I love your blog and looked forward to reading it every morning. Please reconsider after some time and rest. In the meanwhile, I wish you all the best!! Aesthete's Lament, whose post said it all. I'm trying to buck up and think of you rather than myself but, really, it's just too hard! You have introduced me to people, ideas, houses, and design history that I didn't know existed. You've been the teacher I never had but always wished for. Thank you for all your effort. What a sad day this is! In just a year this has become my absolute favorite blog. I've been edified and inspired, entertained and enlightened. And even if I cringe when I see an American throw an extra "u" into words where it isn't needed, I've never once found the prose to be anything other than scintillating. I understand the need to take a sabbatical, but I truly hope, for myself and your many fans, that you'll consider returning to the task after a decent interval of repose. Quality is worth defending. Beauty is worth defending. Talent is worth defending. All of these things promoted through your contributions are important. Please do not go away. Take a break, instead. your daily readers are forlorn. arts loving bunch out here. In all cases, wishing you the very best, and here's hoping we'll be reading your prose -- maybe here or elselwhere. I am so sorry to see this end but I understand. I have a real estate website and just updating that once a week is a chore. Based on your previous post I ordered the "Greatest Rooms" and am looking forward to spending time with it. Thank you for your hard work and the pleasure you have brought to your followers. Please keep your posts for posterity! Oh, I have visited your post on 'Lanterne' style houses at least once every six weeks...and now it is gone. One of my all time favorite posts - ever - from any blog. Your blog will be missed. It's like a death in the blog family, without the pictures to sustain the memory. Sorry to see you closing up shop. Yours was one of the very first blogs I discovered, which in turn led to a never-ending stream of blog delights. But I always returned to yours, for good reason: it was delightful. I do hope there is at least one book left in you! I've learned so much from you...Godspeed! What an incredibly sad day! I can only say that I am going to sincerely miss your posts. It was a bright moment I looked forward to every day! I hope that your personal life continues to be beautiful, and hopefully less stressful! You've removed your older posts; not very sporting. You were willing to write for free when it all went your way, but when you lost your hardon for blogging you take your toys away like a petulant child. The glamazons you say you admire would be far more philosophical and less stingy. Your insecurity and the chip on your shoulder were always the signal features of your writing. A life without bitterness and condescension is far richer than the one you currently lead. It's never too late to change. Did you catch it from Decorno? I am really really sorry to see you go, but I totally understand that there is life after blogging. Except for Anonymous 1.15am (such a brown cloud), I thank you all, so very much, for your encouragement and your good cheer and your appreciation. It was great fun writing this blog, and I am so very happy you all were along for the ride. I have a couple of books I have agreed to write, which I hope you might enjoy when they finally see the light of day! Anonymous 1:15's writing style is unmistakable. Thank you--your wonderful posts have brightened many of my days. I'll be on the lookout for those books! AL - one man's little brown cloud is another man's floating turd. I also want to wish you well. I just discovered you recently, and I'll miss this delightful spot, but blogging is indeed grueling. Just a tiny request to please consider leaving up your archives a short while for those of us who just discovered you recently. And thank you especially for the recent Drabware post. Good luck, and please write many books for all of us to enjoy in future. All best. You disappeared once before and then returned. This time I fear you may be gone far longer. I do follow your writing in the "real" world of print and look forward to reading your prose. I have always been amazed that you maintained your anonymity and have never used this blog to self-promote your work. Like so many others have stated more eloquently, thank you. It has been such a pleasure. It was an honor to share "aesthete" with you. It was, too, impossible to read a post by you and not come away feeling a bit more elegant, refined, knowledgeable and exquisitely mannered. As is usually the case in life, when partaking of the best it has to offer, we are all better for it. Well done Aesthete! And thank you. Words fail me to think of a more poignant lament than your absence. Another idea, ever considered turning your blog into a book? It's been done quite successfully by your fellow bloggers. Just to name a few, The Sartorialist, Facehunter, The Selby, etc. If you did that there is no doubt I would buy it, you have such a talent. Just one more letting you know how much your work has meant and begging you to put back your archives! I can't tell you how often I would find myself reading and rereading them! I feel like I lost my favorite book with no way of replacing it! Although I am a Johnny-come Lately I have thoroughly enjoyed reading about fascinating people from the past which thanks to you have wetted my appetite to find out more. You have great taste and insight into the creative mind. You opened worlds for me. What a gain and what a loss! I understand not wanting to continue this lovely blog and to continue with your life instead...but to take away all those wonderful archived posts is just rude and selfish...why not just leave them forever for everyone to read, study and enjoy? Blogs live forever...you needn't tend the archives. Un grand merci pour avoir contribué si longtemps à ce blog que je prenais toujours plaisir à lire. Merci pour votre générosité et, qui sait, après quelques vacances, aurez-vous envie de revenir nous voir ! how do I save the posts as a word document and read in the years to come? I am sooooooooooo sad. Thank you for the wonderful inpiration!!!! A SAD SAD SAD SAD DAY IN THIS MAD MAD MAD MAD WORLD YOU HAVE CERTAINLY MADE MUCH MUCH MUCH MUCH MORE WONDERFUL. "AN AESTHETE'S LAMENT" WE WILL MISS YOU. a real tragedy. i came here late from dilletante but you were always fascinating as DED is. i hope the 112 comments urge you to come back at some time or publish. i'll buy it no matter the cost. wishing you well but urging you to come back. WAAAAA!!! How sad! I just discovered you! But I understand. the best art blog, artblog.net stopped last month, now you. hopefully you keep the archive available like them, both of you have a fine history of posts to revisit. Clearly I'm behind the ball on this one, and I'm thoroughly saddened, like so many others. Your blog was truly one of the very few worth reading, addressing your subject matter with such an unusual level of grace and seriousness. If we cannot convince you to continue, can we at least request that you leave your pieces up as a reference? Please? Thank god I saved the images over the years that inspired me most as a designer, but your blog was a constant delight and your archives yielded new areas to research that aren't commonly covered by publications, and sadly seldom in books. Young designers must stand on the shoulders of their forebearers, and you made that a little more possible. Your research was a constant support and inspiration. Please leave your archives intact if you cannot continue updating them -- they are an incredible and rich body of knowledge. Please? I was heartened at least, in reading back on your comments, that you have agreed to write a few books -- bravo, over and over -- but then realized I will have no way of finding them, as your name is completely absent. Perhaps people in the know know who you are, but I do not. I hate to think you would have a publication (or really, you probably have many already, and I would love to read them) and I would miss it for the sole reason of not knowing where to look! I second Nick Heywood's comment that you need to stand here before your friends and let us know you by your name...so that we know how to order these books in the making although I suspect one book may be "An Aesthete's Lament." And leave it to HOBAC to write the best zinger to Brown Cloud. I always thought that you, HOBAC, Toby Worthington and Magnaverda should have had your own podcast. Wow, that's too bad, and what a shame about taking all you old posts down, too. What a loss! Your postings will be missed. They were one of the few treats I allowed myself during work each day. I've been out of town and am thus late to comment. Best of luck to you! I learned so very much from you, and for that I am very grateful. Thank you so much. You have taught me much, given me laughter and reminded me of what is important when my j-o-b threatened to crush my spirit...Best wishes to you! Happy sailing to you! We await your books with impatience. I will miss all the history lessons, well researched posts, unmatched way with words and of course your beautiful posts on china to include those of your own table. I will remember last Decembers with the hurricanes so fondly! I am sad that my time with you was so short. Thanks for the past two years! Blogging is indeed very time consuming so I fully understand. Enjoy a freer life! Your blog will be missed. Look, there are 137 of us begging for more. Isn't there a pay-for-view model that would make your blogging more worthwhile? A private subscription where we each pay say $30 per month? You're a beautiful writer who inspires us all each day. That's worth a lot more than $30 per month . . I thought about this for a while, and I understand perfectly, though I am saddened to lose you. You are an extraordinary example, mentor, and scholar. Thank you for everything you gave along the way, my best wishes go with you. I've enjoyed your blog so much. It's been part of my day to day life and I will miss it. Well written, informative, good historical design info. Best of luck to you with whatever you do next. Oh, no! My favorite blog - gone, gone, gone... Life just got a little bleaker. Sorry to see you go. Too suddenly you go! Loved reading you. Come see me, please! I worry about you. Oh, this is too awful. Truly, I am weeping. Linda. wow! It must be bittersweet to leave these adoring fans. I hope we get to hear what is next for you. You are a talent. I will miss you but sympathize with the responsibility of providing continuing entertainment and edification. It was a good blog and I enjoyed it very much. You have earned your rest. I too am heartbroken, but I completely understand. Blogging is hard work. Tragic! Now what will I read? Someone who thinks Ghost chairs are the pinnacle of design? Say it isn't so!! You are a wonderful writer and I have always loved all your posts. I wish you all the best. It not the End of the Line. It's the Decline of Western Civilization. Everything has its moment, and after a while things are not quite such a thrill as they once were. Though your blog continued to delight. Damn, damn, double damn, triple damn, hell. Maybe after a while you can let the old posts available for visiting... I sure hope you do. Please consider even the odd post. We'll wait. You're worth it. Thank you so very much for your historically beautiful posts and the time you invested in writing them. Oh...just found your blog...and now it's gone. :-( Is there a way to view your archives? I'd love to read those. Best luck to you in the future...hope you return one day. What, oh no.....I understand, will miss you terribly!! But Dearest Aesthete, Do smother this comment in the cradle as you say- if it deters you from coming around often or even occasionally. Sad to see you leave off. I've enjoyed Aesthete's Lament and will miss your posts; it's been one of my favorites: consistently amusing and full of things to see. Thank you for indeed, raising the bar and for so many interesting reads. I've loved your blog since my very first visit. In March I was at a cocktail party in Connecticut and when a guest discovered I wrote a blog, she immediately started listing her favorites. An Aesthete's was #1. I only discovered this wonderful blog last year, and have returned to it many times since then. Actually, it is one of the few sites I visited when the daily news became too grim or overwhelming. Thank you for composing so many thoughtful and inspired posts. I only wish the links remained active, there is much here that I'd like to revisit and print out for inspiration. Oh, it saddens me, just as I got so used to your insights, detours to great points of view and knowledge, which made my day a little richer! Utterly egotistical motives, I am aware! But I understand the feelings which let you decide on this move! May you see all your dreams and plans for the future come true! Fare well! unfailing interest in the esoteric and the sublime. very selfish, and besides, everyone else has doing that, so you know how we all feel. boo - hoo. I wish you the best in all your endeavors - and loveliness in everything you see and do. I'm so sad you removed all content... I somehow thought that will be here forever. Just stopping back in to see an old friend and say I miss you...and think of you often. If you write a book, please infirm us all! Are you your sister ? Because she stops to cook too. Sorry, Mob. Have been seriously behind on The Aesthete Cooks. Will get to it ASAP. So you will continue "The Aesthete Cooks"? I do so miss AAL. I have not posted for over a month due to cancer so I understand exhausted but you are missed. Dear Nancy/Riviera, I hope you will be back in full, fine form in short order. I understand it is not an easy road, having a friend who recently went through the same illness. You have my best wishes and prayers.